Florida's bitter races for the U.S. Senate and governor appeared headed to recounts on Friday as Republican margins of victory narrowed and President Donald Trump vowed to send in lawyers in a scene reminiscent of the state's dramatic 2000 presidential recount. Tensions rising in Florida where bitter races for the U.S. Senate and governor appear headed to recounts... with the political storm reminiscent of the state's dramatic presidential recount, back in 2000. 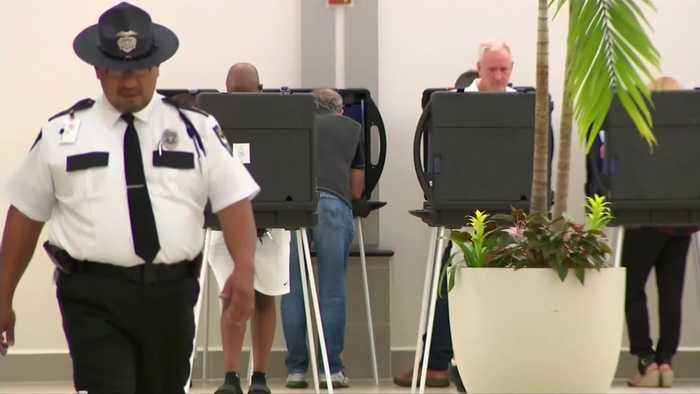 The races remain unresolved with Republican Governor Rick Scott's lead over Democratic incumbent Bill Nelson dwindling within a margin that qualifies the voting for a recount by hand. On Friday, President Donald Trump weighing in. (SOUNDBITE) (English) U.S. PRESIDENT DONALD TRUMP, SAYING: "All of a sudden they are finding votes out of nowhere." Trump vowed to send lawyers to investigate. On Thursday, Scott filed a lawsuit against the election supervisors in Broward and Palm Beach counties. He's accused the officials of mishandling the ballot count and of preventing observers from having full access as votes are counted. (SOUNDBITE) (English) FLORIDA GOVERNOR RICK SCOTT, REPUBLICAN SENATE CANDIDATE, SAYING: "Both Broward and Palm Beach Counties have failed in their duties to follow Florida Law which requires Vote by mail and absentee ballots are counted with in thirty minutes of Polls closing." Nelson, in a statement, fired back at Scott. (SOUNDBITE) (English) U.S. SENATOR BILL NELSON, FLORIDA DEMOCRAT, SAYING: "Clearly, Rick Scott is trying to stop all the votes from being counted and he's impeding the democratic process." The drama conjuring memories of the state's 2000 presidential recount. Bush defeated Democrat Al Gore. In the governor's race, an automatic recount is likely for Republican Ron DeSantis and Democrat Andrew Gillum. DeSantis had a .45 percent lead -- just under the 1/2 percent margin for an electronic recount. Gillum had conceded but said his campaign was prepared for any outcome.